If you’ve never considered electric heat, now is the time; heat pumps are more efficient than ever and will eliminate or significantly decrease the amount of heating fuel you use to heat your home or business. Heat Pumps (also called “ductless heat pumps, ” “mini splits” or “air source heat pumps” are most of the world’s most common source of heating and cooling, and are becoming more and more popular in Maine, where they can be used to save up to 300 gallons of oil per season at a much lower cost to the home owner, and continue producing heat at temperatures as low as -17 degrees Fahrenheit. Heat pumps use the same technology that your refrigerator uses, but are used to transfer heat into your home rather than cool air (though most heat pumps can also be used for cooling in the summer). Heat pumps are remarkably efficient – for every unit of electricity used to power a heat pump, an average of 2.7 units of heat are produced. Perfect for supplemental heating or smaller homes, heat pumps are an affordable, money-saving option that can even be connected to your home’s solar panels to provide an even more complete sustainable solution. True North currently installs Fujitsu and Mitsubishi Heat Pumps, which offer a vast array of efficient electric heating and cooling options for your home. Get started today by calling our team of Energy Advisers, who will help you determine what works best for your home and lifestyle. 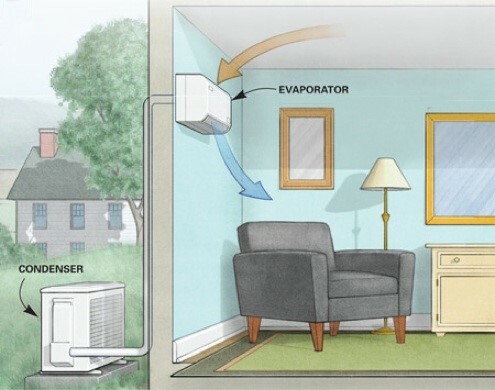 A heat pump consists of two major parts – a “wall cassette” (the “evaporator” in the diagram above) that is mounted inside your home, and a condenser unit that stays on the outside of your home. The heat pump’s wall cassette and condenser units are connected by refrigerant line. Every unit of energy required to run the fans and compressors in a heat pump creates up to 3 units of energy. This ratio of energy used to energy created is called a Coefficient of Performance (COP). A typical heat pump in Maine through an entire heating season has an average COP of 2.7. In real-world terms, this means that to generate the amount of heat you’d get from a gallon of heating oil with a heat pump, you’ll pay about $1.60 with the heat pump vs. $2.56 for the gallon of oil. 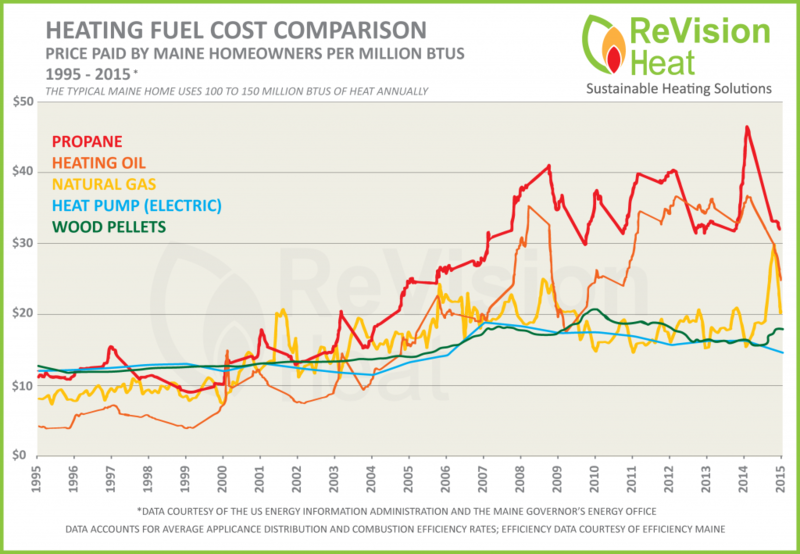 The chart below plots fuel heating costs for Maine home owners per million BTUs of heat for each of the five major heating fuel types used in Maine over the past 20 years. A typical Maine home uses 100 to 150 Million BTUs of heat annually. Electric heat using high efficiency heat pumps (rather than conventional – or resistive – electric heat) is, obviously, dependent on electricity costs; however, the cost to heat with heat pumps is historically much more stable, having avoided the peaks and valleys of oil, propane or natural gas. Find out more! Visit our Solutions page to learn about the types of heat pumps we offer, read case studies and more. Or get started today with a free in-home heating assessment.